The track of our first-known interstellar object, now named 'Oumuamua, as it passed through the inner solar system in late 2017. The arrival of an object from beyond the solar system caught astronomers by surprise — but that doesn't mean that they were unprepared to study it. When the first-known object from interstellar space slipped through the inner solar system last month, the welcoming party wasn't quite ready. It passed within 0.25 astronomical unit (37,600,000 km) of the Sun on September 9th — yet wasn't discovered until October 25th. But in the weeks since, astronomers have more than made up for their celestial slight, marshaling telescopes around the world to learn as much as possible about this interloper before it slips out of visual range, never to be seen again. The flurry of activity hasn't been limited to making observations, as officials at the International Astronomical Union struggled with what to call this body. At first astronomers thought it was a comet, based on its extreme orbit, and so the IAU's Minor Planet Center applied the designation C/2017 U1. But when even the deepest telescopic images revealed no hint of a coma or tail, they decided it must be asteroidal, so the designation morphed to A/2017 U1. What does 'Oumuamua really look like? This artistic portrayal of the object 2016 WF9, shown passing Jupiter’s orbit, might provide some clue. Behind the scenes, in an unusual effort to name the new object quickly, emails zipped back and forth among the IAU's General Secretary, its Division F president, co-chairs of the IAU's Working Group on Small Body Nomenclature, and the Minor Planet Center. The chosen name, submitted by the team at the Pan-STARRS telescope who discovered it and announced November 6th, is 'Oumuamua. It's a Hawaiian construct combining 'ou (to reach out) and mua(meaning first or in advance of). The second mua is for emphasis. But asteroids are not catalogued by name alone, and this is the first of an entirely new class of object. So, at the suggestion of MPC associate director Gareth Williams, the IAU adopted the identifier "I", for interstellar. "All parties involved in the discussion agreed that the proposal was suitable," he says. "Took less than a day to sort out, announcement followed the day after." As noted in the announcement on MPEC 2017-V17, "Correct forms for referring to this object are therefore: 1I; 1I/2017 U1; 1I/'Oumuamua; and 1I/2017 U1 ('Oumuamua)." Those who work the comet and asteroid trade aren't enamored with the use of "I" — after all, the IAU has gone out of its way to avoid using "I" and "O" in designations because they look too much like the numerals "1" and "0". Several have suggested substituting "E" (for extrasolar) instead, but Williams defends the IAU's decision, noting that "E" could be interpreted as "extraterrestrial," with the implication of intelligence behind the object, and "G" (for "galactic") is too limiting. 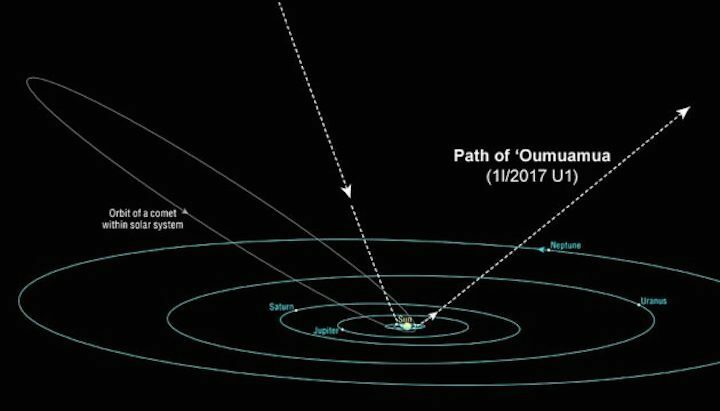 The first characteristic that marks 'Oumuamua as being from outside our solar system is its orbital eccentricity, 1.19. If you ever took geometry, you might recall that the eccentricity of an ellipse can't exceed 1.0. In fact, dynamicist Bill Gray (Project Pluto) regrets that he didn't pick up on 1I's interstellar nature a few days sooner — his orbit-calculation software kept rejecting the eventual solution as being impossible. One lucky break came immediately after the MPC's initial announcement. Observer Joe Masiero (Jet Propulsion Laboratory) just happened be in the middle of a run with the 5-m Hale Telescope at Palomar Observatory, and he quickly obtained a spectrum that's reproduced below and explained in more detail here. There's no obvious absorption that would signify the presence of particular compounds or minerals. 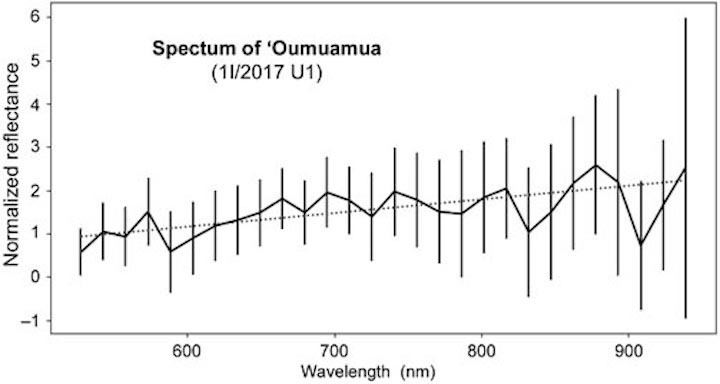 A spectrum of 'Oumuamua (1I/2017 U1), acquired on October 25, 2017, with the 5-m Hale Telescope. Vertical bars indicate error bars at each measured wavelength, and the dotted line shows the overall trend to slightly brighter red and near-infrared wavelengths. But the gentle slope, increasing toward the red (right) end, suggests that 'Oumuamua is not a particularly good match to objects in the Kuiper Belt (which tend to be much redder). Instead, it's the kind of spectrum that a rocky surface would exhibit after being "weathered" by long-term exposure to space radiation. 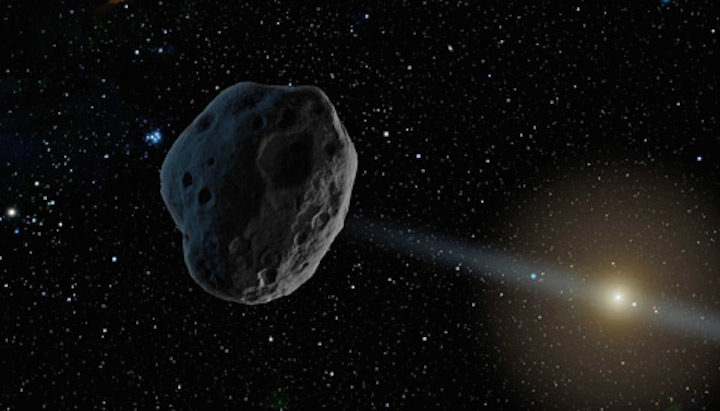 Others have attempted to record the object's light curve and determine its rotation period. Observations by Matthew Knight (University of Maryland) and others show clear variations in the apparent brightness of about 1.2 magnitudes. Knight and his team suspect the object is highly elongated, at least three times longer than it is wide, and rotates with a period of between 3 and 5 hours. The Hubble Space Telescope might have the final word on the character of 1I/2017 U1. A team led by Karen Meech (University of Hawai'i) has been granted HST time to study the quickly disappearing interloper. "Our observations have not executed yet," Meech says, "and the experiment requires three visits — the last of which will be at the end of the year." And, of course, there's been a flurry of speculation about where 'Oumuamua came from. Dynamicist Eric Mamajek (Jet Propulsion Laboratory) points out that the object's incoming velocity (26 km per second) is within 5 km/s of the mean galactic velocity of stars that lie within 25 parsecs (80 light-years) of the Sun, but it does not match the relative velocity of any of the dozen nearest systems. These characteristics all suggest that 'Oumuamua has been drifting among the stars for a very long time, perhaps billions of years.